As a general rule of thumb, for most products out there we as people tend to have the same belief, the more expensive it is the better the quality should be. The headphone industry is probably more susceptible to this line of thought than any other with the general thought process being if you want great headphones, you’ve got to be willing to pay more. AKG is one of the few companies out there that have been willing to buck this trend from time to time and is probably the most successful at doing so. 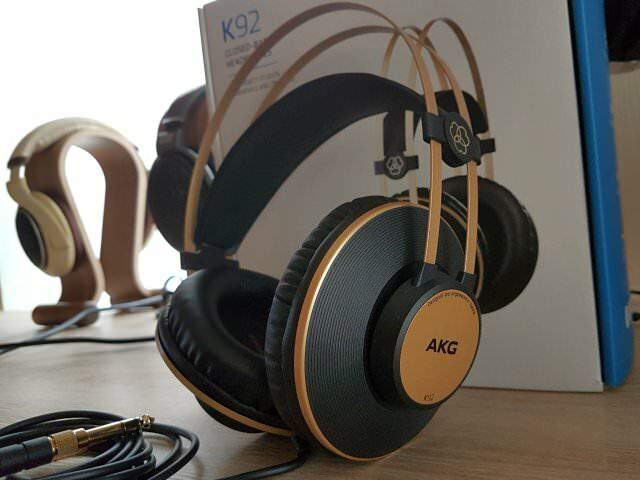 With the budget AKG Pro Audio K92 Closed-Back Headphones for professional mixing and mastering, AKG has made a solid attempt at sticking it to all the audiophile snobs out there, me included. Equipped with a closed design means the K92 doesn’t leak out much sound and so they’re perfect for not disturbing others around you. The gold trim on the otherwise all black headphones immediately catches the eye, and personally I feel it adds a unique and classy touch to these headphones, although it’s fair to say I’ve heard some disagreements with that assessment. The circumaural (over the ear) design of these headphones mean they’re supposed to sit on your head and cover your ears, which they manage to do by using large earcups. This fact is supposed to mean your ears are comfortable throughout the time you’re using the K92’s, however for some reason AKG decided to mess this up a bit with a near flat design inside the ear-cups. This design flaw meant the inside of the earcups was slightly pressed against my ears, detracting from the otherwise fairly comfortable feel of the leatherette ear-cushions and the lightweight feel of the headphones. However the large earcups mean these aren’t the most portable headphones in the business. In fact it would be fair to say they are unusually bulky even for a pair of professional monitor headphones, so forget about using them while out and about unless of course you enjoy looking like you’re about to let out a dub-step mix on the streets then by all means go for it. For the more appearance conscious folk out there, the K92’s are more appropriate for in-studio use, on-stage, in your home, on your desk at work, or even on long journey’s (plane rides, train rides, etc). The headband is self-adjusted and usually that would be a bad thing but the K92’s are designed in such a way that the pressure from the headband is felt on your head and not against your ears. I did feel like they had a clampy feel to them the first few times I used them, but that went away with time. The 3 m non-removable cable connects to the left ear-cup and is thick enough not to tangle, a useful feature if you’re going to be moving around on stage or in the studio. Big pleather comfortable earcups with left and right markers so you won’t accidentally wear them the wrong way. The price tag on the K92’s is their major selling point, but does this mean we should be worried about their build quality? Not really. The cheap plastic used on the headphones means they have a fragile feel to them, but unless you’re throwing them around and are abusing them, you don’t need to worry at all. This is because the headphones are so lightweight that there is hardly any weight if they should fall to the ground. That doesn’t mean of course you can keep letting them fall onto the ground, but you get the picture. Furthermore, the cable connection to the left ear-cup seems quite sturdy enough and isn’t liable to break at any given moment. The K92 with its 32 ohms input impedance doesn’t really need and amp to drive them, so don’t worry about that. What these headphones lack in premium build quality AKG quite clearly made up for with the sound. In fact I think it’s fair to say they probably felt this was the most important area to focus on. The K92’s are equipped with 40 mm drivers that have a frequency response of 16Hz to 22kHz, which is better than one would expect in this price range. The sound itself is crisp and clear, with well rounded mids and highs. The bass is not enhanced and as such may feel lacking for ‘bass-heads’, however this is exactly what you want when mastering a track as it provides authentic feedback. The lack of enhancement doesn’t in any way mean poor bass. On the contrary the bass hits just when it should, with the drums from my favorite track hitting with just the right amount of snap. Listening to The Weeknd’s album Starboy is a very satisfying experience. From the two Daft Punk collaborations ‘Starboy‘ and ‘I Feel It Coming‘, to ‘Party Monster‘, the K92 handles these songs with great authority and a lot of smoothness. The matte gold on the otherwise black headphone is absolutely gorgeous and make the K92 a real eye-catcher when friends come over. This brings me to the point that the K92 is a very easy (read, smooth) listening pair of cans. They don’t sound super exciting nor do they sound boring. And sibilance is nowhere to be found! However, if you’re looking for a more lively sound in the same budget, the Superlux HD661 is a good alternative. There is almost zero distortion on the different sounds, which is almost unheard of for headphones in this price range. The slight distortion there is stems from the sometimes suppressed soundstage, which means the different instruments almost sound as if they’re coming from the same area, this is most prominent when listening to complex live music. The voices on the various tracks always sounded expressive and nuanced, leaving little room for complaints in their definition. The dynamics of the K92’s are well rounded considering their price point and even the most acoustically complex songs didn’t sound muddled in any way. The isolation on these cans is fairly good and almost completely managed to close out unwanted sounds without me having to play my music at the highest setting and although some high sounds managed to penetrate that ‘isolation’ we seem to crave while working, it’s to be expected with any non-noise cancelling headphones in the business. The self-adjustable headband makes sure you’ll always get a perfect fit. Overall the K92’s did succeed in avoiding some of the pitfalls that are the downfall of so many budget option headphones out there. They’re not flimsy, don’t have a liable-to-break-at-any-moment body, nor do they sacrifice some degree of comfort. The sound quality is superb for this price and you’d be hard pressed to find better sounding headphones for two figures let alone for $60. 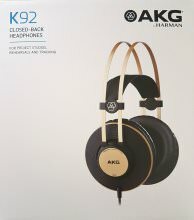 All things considered, while the AKG K92’s are certainly not the best headphones in the game (that would be a miraculous feat given how much they cost), they are among the best budget headphones you could ever find. And if you aren’t willing to bow to the snobbery of having the latest and most expensive headphones in town then you can do no better than these headphones in terms of value for your money. As always, if you have any questions, shoot me a comment! 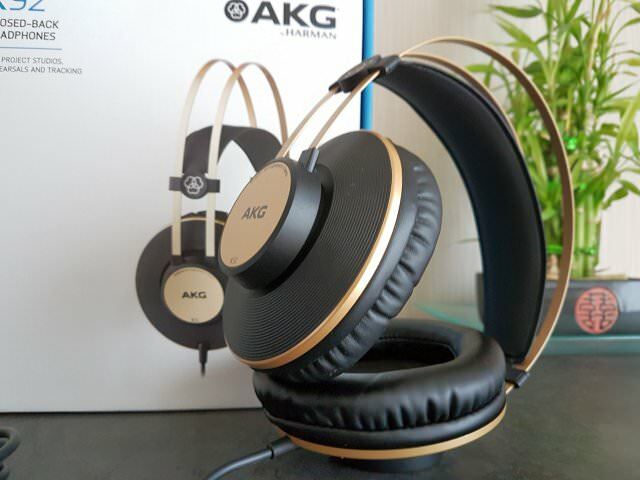 The AKG K92 is a golden opportunity for the value conscious listener looking for a smooth and relaxing sound without sibilance. 1- build quality MUCH better than those of sennheiser HD201.. I have no complaint about build quality. 1- BASS ,is much deeper than the one in HD201 ,though I never complained about the HD201’s bass,someone in a review, called the bass bloated..
may be cause he used to listen to another headphone with thin Bass? 2- MIDS ,in some song I get them crisp,clear,in others,I hear them distant recessed ..
3- TREBLE : there where I found the biggest difference between the k92 and the HD 201..
but with k92,it is dull ,weak ,till I used the DFX enhancer with the Winamp…and now sounds normal..
Hey Mario, thanks for your quick comparison with the HD201, although I haven’t heard HD201 yet. The K92 isn’t the most lively headphone, so it’s great to see you got it where you want it to be with a bit of EQ. Cheers! 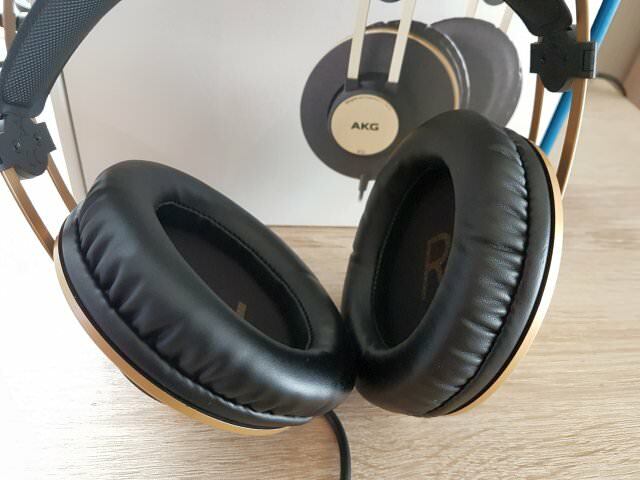 1-AKG k52 ,k92 , Samson Sr850..
those are the cheapest and the most hailed online,especially the k92 ,, question will the akg k92 give me more details and clarity than the sennheiser hd201? I heared that the philips is the best ,but the dilemma that open design is a problem for me when i listen to music at night beside someone sleeping!! which choice better, the Shure or audio technica? is there a sound clarity and details differences between akg k92 and the Shure ,worth paying more than double the price? )the first costs 43 dollars ,the second 100 dollars) I’m living in Colombia.. The ATH-M50x is a good option, although it’s a bit bulky and can become somewhat uncomfortable with long listening periods. I’ve reviewed them here. In terms of comfort the K92 beats both the Momentum and the M50x. I don’t have experience with the other headphones, so I can’t comment on that. Hi. 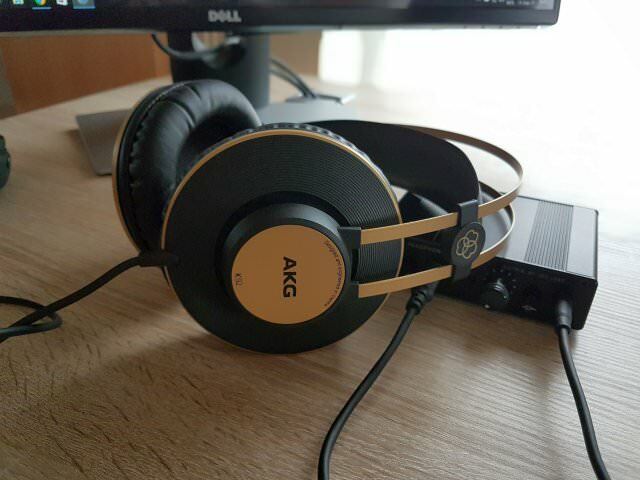 Is akg k 92 is comparable to senhheiser hd 598 or hd 558 or are they in another league? I’ve not heard the HD 558, but I do have an HD 598 myself. The HD 598 is one of the best budget HiFi headphones under $150, and to be honest, is better than a lot of costlier headphones. While the K92 is a very good headphone for its price, imho it cannot compete with the HD598. Both on sound (great soundstage!) and comfort (velour pads!) the HD598 is much better. Please check out my review on the HD598. I always try to avoid those overpriced, trendy headphones. They are far too garish and bass heavy. As a trained sound engineer, I try to stick to reasonably flat response headphones. Do you think these might fit the bill? They look so comfy too! I already own a Bluetooth akg y50bt set and they are brilliant. Hey Mat, the K92 is indeed a reasonably flat sounding headphone. No V-shape here. From what I’ve read, the Y50BT is a great Bluetooth headphone. Hey Jurgen, I like music very much and good to read this. I own a beats and sony headphones and have sony earphones for my outdoor use.To be very honest I bought my Beats quite expensive, I think most goes to the brand cost I think. The reason I like your headphone review is because I like gold color and light weight. SO perhaps I will definitely shortlist this my THIRD headphone. Hey Maxx, you’re right about your Beats headphone 😉 But don’t worry about it. Happens with more products than people would think. The important thing is that you like them. 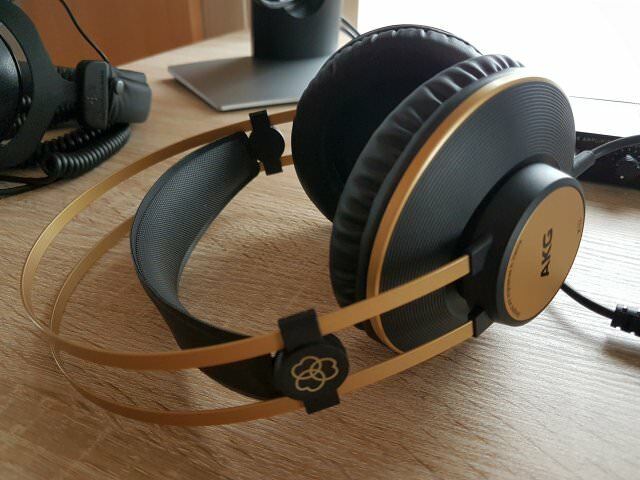 The design on the AKG headphones is a beauty. They look so sleek yet professional and actually reminds me of a pair of gold skull candys I used to have. The fact they don’t leak out too much sound is a huge plus with these headphones and make it perfect wearing them out in public. It’s almost hard to believe you can get headphones at this quality at such a low price and you did an excellent job at outlining and scoring each one of the specs. You really know what you’re talking about when it comes to headphones and I appreciate the included details for helping us make a better buyers decision! You’re welcome Peter and thank you. Having pricey headphones has become so trendy. I admit the Beats by Dre and Bose headphones are attractive but I appreciate you sharing this much cheaper, yet still high quality set of headphones. I had never heard of this brand before. I wish I could wear ear buds because their much smaller but there is something about having them inside my ear that bothers me. So, I opt for these bigger style headphones, the sound quality is much better anyway. This might be a weird question but do these headphones have a microphone for talking on your cell? Hey Layne, I think it’s important to not only look at the more expensive headphones as their are lots of good cheaper options out there. The bonus you get with the K92 is that AKG managed to create a good looking headphone that doesn’t necessarily look cheap.